The life story of Richard Feynman is one that in science circles is oft told, and many of his exploits are already the stuff of legend. His effusive personality coupled with his brilliant mind has earned him an almost mythical status in the annals of science. It takes an especially keen eye to be able to retell his well-worn tales in a way that’s truly new and innovative. Author Jim Ottaviani and artist Leland Myrick's new graphic novel Feynman stands out. It strings together favorite Feynman stories, and some less well known tales, into an intimate, sometimes hilarious and oftentimes moving portrait of the life of this Curious Character. Ottaviani is no stranger to fusing science, history and comics. His earlier works, including Suspended In Language : Niels Bohr's Life, Discoveries, And The Century He Shaped and Fallout : J. Robert Oppenheimer, Leo Szilard, and the Political Science of the Atomic Bomb interweave the lives of famous physicists with their discoveries, politics and personal histories. For his latest book he turns his sights on the life of one of the most beloved and storied physicists of the 20th century. Feynman was a man who was in love with science and living life to its fullest, and combined the two together every chance he got. As famous for his antics as well as his groundbreaking science, Feynman's life took him from his upbringing in New York, to New Mexico to build the atomic bomb, California as a professor, Switzerland to receive the Nobel Prize and ultimately Washington DC to help investigate the Space Shuttle Challenger disaster. Always one to push the envelope as far as it can go, he famously picked locks to top secret files at the Manhattan project and learned to play the bongo drums all the while leaving an indelible mark on physics. Feynman famously struggled to find a way to explain to non-physicists his greatest accomplishment, Quantum Electrodynamics for which he won the Nobel Prize, and effort to do so is entwined throughout the book. QED is fiendishly complex, usually only broached during graduate level physics courses. It explains the ways that matter and light interact and ties together quantum mechanics and special relativity. As Feynman said, "It describes everything except for radioactivity and gravity. That’s a lot!" Always up for a challenge, he set out to explain the unexplainable, first to audiences in New Zealand, then later in California at the University of California. Beautiful interpretative metaphors for the subatomic particles he's describing swirl around the gesticulating scientist. Isaac Newton and James Clerk Maxwell both stop by for a cameo. Never has a professor explaining theoretical physics seems so accessible and dynamic. As much as possible, Ottaviani sticks to the original lectures; a testament to both Feynman's showmanship, and Ottaviani's keen eye for finding moments from life that need little reinterpretation. Feynman put these lectures together to fulfill a promise to his friend Alix Mautner, and dedicated his California lectures to her after she passed away. He was always troubled by the fact that he was unable to satisfactorily explain QED to her and wanted to find a way to share his discovery with the world. The book's greatest strength is tracing the many influences on the famous scientist. Some of the most moving scenes come near the beginning while Feynman was working at the Manhattan project developing the atomic bomb. Feynman's wife Arline bought him pencils with "Richard darling, I love you! Putsy," inscribed on them. Fearing embarrassment, he promptly scratched off the inscriptions. When she found out that he was doing this, she wrote to him asking "What do you care what other people think?" a phrase that stayed with him and in many ways defined how he looked at the world. Comics are the perfect medium to capture these intimate moments. Myrick's natural yet expressive line drawings capture the scene beautifully. What the reader is left with is a unique introspective portrait of one of the twentieth century's most unique minds. Exhaustively researched (Ottaviani said in the bibliography that his Feynman references are over a meter high) Feynman is a true testament to both the uniqueness of Richard Feynman as one of the twentieth century's most remarkable scientists, and the exceptional ability for comics to capture his one of a kind personality. Hi... just wanted to say how much I enjoyed this book. I'm a part of a song-writing book club and we recently wrote and performed songs in response to this book. Jim Ottaviani was there to speak answer questions from the audience. You can listen to the songs at bushwickbookclub.bandcamp.com . I made Feynman Diagram pretzels too. What a fun night. 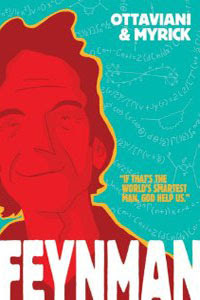 "Feynman" is a loving look at the life story of a man whose brilliance shone clarifying light into some murky corners. A wonderful read. Comic-Con: Building a real Iron Man suit? Did Colossal WWII Bombing Raids Alter Weather?